Hello photography fans! 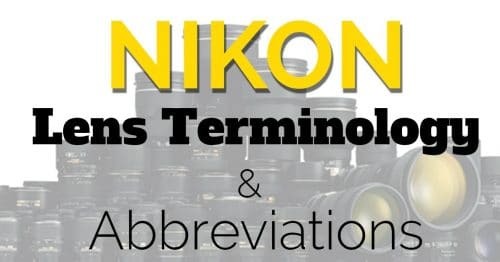 Welcome to the latest in our series of manufacturer lens guides, where we take a headfirst dive down the rabbit hole that is lens terminology and abbreviations so that you don’t have to! Today ladies and gentlemen we will be attempting to unravel the nomenclature of stalwart industry giant Fujifilm! Fuji Photo Film Co. Ltd was founded in 1934 with ambitions to become Japan’s first manufacturer of photographic films. In the 1940’s, having achieved their initial objective the company expanded into the optical glass and equipment industry, manufacturing various products including X-ray and printing equipment. Fuji remained a dominant force in the photographic film industry and manufactured a number of successful rangefinder and SLR cameras under the Fujica brand between the late 1940s and 1980s, the coming of the digital revolution however saw a great decline in the demand for photographic film; Through great foresight, the company was able to anticipate the oncoming switch from film to digital photography, and following a period of great restructuring Fujifilm emerged as a successful manufacturer of both digital cameras and lenses. Fast forward to the present day and Fujifilm are still a hugely respected and successful manufacturer of compact digital cameras and mirrorless camera systems. At the time of writing this article Fuji are one of only two camera manufacturers in the world offering a mirrorless medium format camera system. Fujifilm lenses are often also referred to as Fujinon lenses. Fujinon is the name of Fujifilm’s in house lens brand and the use of the designation does not imply a different lens specification. All Fujifilm/Fujinon lenses have their lens model name and specification printed around the end of the lens barrel, either surrounding the outside optical element or in the case of some zoom lenses, around the outer surface of the barrel itself. In 2017, Fujifilm launched their first pair of MK lenses for professional cinematographers an MK 18-55mm T2.9, and an MK 50-135mm T2.9. These new lenses cover the Super 35 format and are available with both the Fuji X-Mount, and Sony E-Mount. The budget-friendly end of the cinema zoom lens market is seeing a huge growth as high-end digital cinema camera pricing also falls, and Fuji’s first foray into this lower price point cinema sector was met with high praise from cinematographers. Sadly, the MK lenses are not available with a Canon EF mount due to the huge different in flange depth of mirrorless systems like that of Fuji and Sony. Whilst you can adapt Canon lenses to work on E-Mount, you cannot adapt in the other direction, so it’s not possible to adapt an MK E-Mount (or X-Mount variant) to work on a Canon camera. 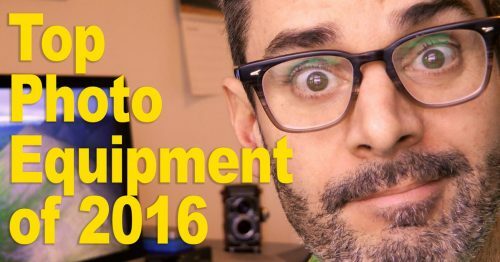 Nonetheless, if you’re a Sony or Fuji mirrorless shooters making movies, these should be on your list! At the time of writing, the MK lenses were introduced for $3800, and believe it or not, that’s incredibly good value for a lens of this quality that features minimal focus breathing, and parfocal behaviour. 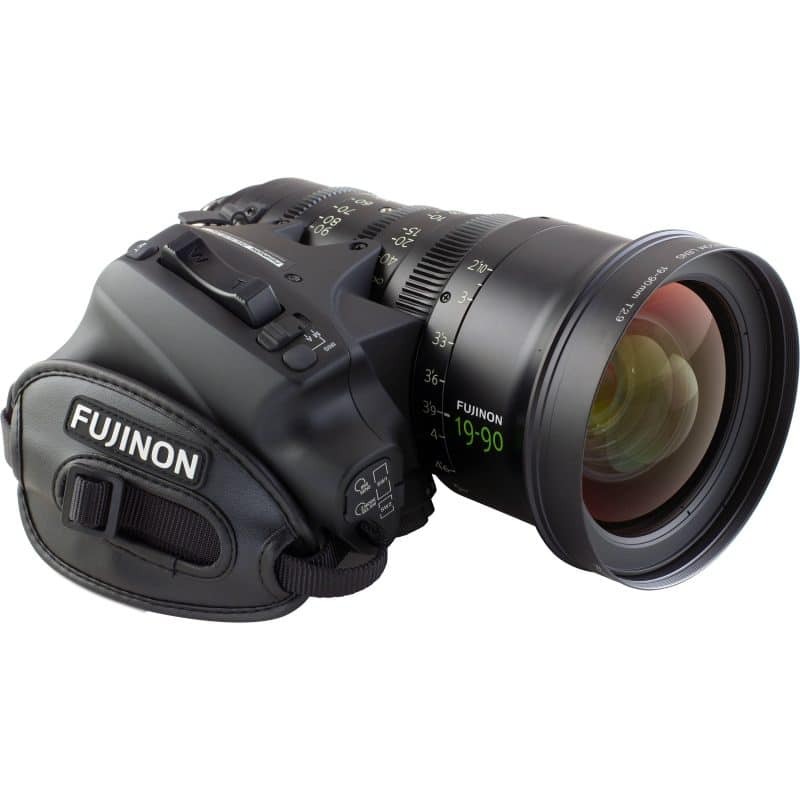 The Fuinon Cabrio lenses are a subsection of the PL mount lenses that Fujifilm manufacturers for use in high-end video production. Cabrio lenses feature a grip on the side of the lens that allows the camera operator to use a rocker switch for adjusting zoom, focus and iris diameter. For more information on the PL mount, see the PL section further down the page. 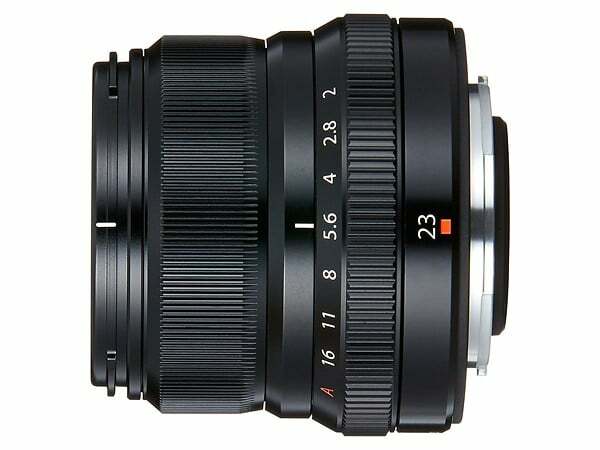 The hugely popular Fuji 23mm f/2 WR provides an equivalent field of view to a 35mm lens in full frame terms. The Fujifilm X-mount is the mounting system currently utilized on Fujifilm’s range of APS-C sensor X-Series digital mirrorless cameras. Launched in 2012, the current X-Mount is a fully electronic bayonet mount system. Being a relatively small system the X-Mount family is small in comparison to the likes of Canon’s EF range, but it is constantly expanding as Fujifilm release new X-Mount lenses and X-System cameras. All Fujifilm X-Mount lenses resolve an image the size of an APSC format sensor. There are two specific ‘classes’ of X-Mount lenses XF and XC (see below). All X-Mount lenses will include either XF or XC in the lens model designation embossed on the lens barrel. The XF class of X-Mount lenses are the highest quality X-Mount lenses currently available. XF lenses feature fast apertures and high quality ED, and ASP elements. XF lenses also often feature rugged metal barrels often with weather resistant construction. 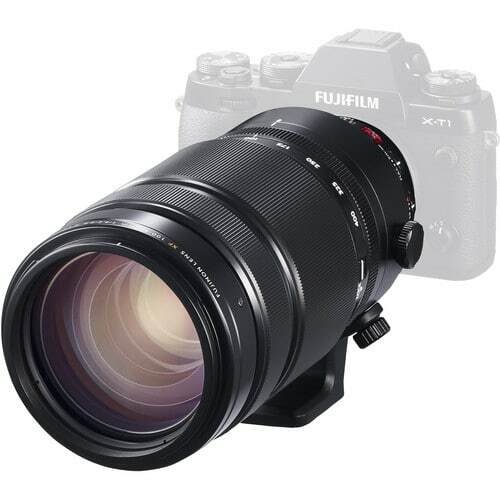 Due to the high quality of their construction XF lenses are more expensive than their XC counterparts, the Fujifilm XF 100-400mm f/4.5-5.6 R LM OIS WR for example will set you back a cool $1,899. XF Zoom lenses are identifiable by the embossed ‘XF ZOOM’ marking on the lens barrel, XF prime lenses, often being much smaller carry no distinguishing mark other than the inclusion of ‘XF’ in the lens model designation. XC class lenses can be viewed as Fuji’s budget oriented X-Mount lenses. There are currently only two XC lenses, both feature plastic barrels and lack the aperture rings often found on their XF R siblings. XC lenses also feature slower apertures but still feature ED and ASP elements to ensure consistent and high image quality. Often found bundled with Fujifilm’s lower priced mirrorless cameras, both the current XC lenses are under $400 and can be identified by the inclusion of ‘XC’ in the lens model designation. The Fujica X-Mount was the mounting system employed on many of Fujifilm’s analogue 35mm SLR cameras. It was introduced in the 1970’s and lenses were made in both X-fujinon and X-Fujinar designations. The Fujica X-Mount system used a bayonet design and was completely mechanical, the advent of autofocus in the 1980’s rendered X-fujica mount lenses mostly obsolete. I am mentioning it here because the similarity in name to the current Fujifilm X-Mount system may lead to some confusion over lens compatability. Fujica X-Mount lenses ARE NOT directly compatible with the current Fujifilm X-Mount system. In order to use Fujica X-Mount lenses on current fujifilm X-Series digital cameras the correct lens adaptor must be used. The G-Mount is the mounting system employed on Fujifilm’s new GFX-Series mirrorless medium format digital camera, the GFX 50S. The GFX 50S is the first camera to use the G-Mount, which is a fully electronic bayonet mounting system. At the time of writing there is only one class of G-mount lens named ‘GF’; There are currently only three GF lenses available. G-Mount lenses are identifiable by the inclusion of ‘GF’ in the lens model designation, and the ‘GF Fujinon’ marker embossed on the lens barrel. GF lenses are the first range of G-Mount lenses available for Fujifilm’s new GFX mirrorless medium format camera system. GF lenses are extremely high quality, featuring ED, Super-ED, and ASP optical elements to ensure minimal optical distortion. All GF lenses (at the time of writing) feature rugged metal construction and weather sealing. GF lenses resolve an image the size of a slightly cropped medium format image sensor and due the size and complexity of their construction are extremely expensive; The Fujifilm GF 32-64mm f/4 R LM WR is $2,299, ouch. GF lenses are identifiable by the inclusion of the letters ‘GF’ in the lens model designation, and the ‘GF Fujinon’ marker embossed on the lens barrel. So here is where things can become a little confusing. Many people will have heard of the Hasselblad H-System and its native range of HC medium format lenses. What you may not realise however, is that the H-System and HC lenses were developed and manufactured by Fuji. The question of whether or not Hasselblad collaborated with Fuji in the production of HC lenses remains a little murky, some people say they did, some however claim that Hasselblad HC lenses are merely a rebranded Fuji product. The H-Mount first appeared on the Fujifilm GX645AF medium format camera which was introduced in 2003. Hasselblad also marketed the camera under the model name H1. The GX645AF was discontinued in 2010, Hasselblad however continued development of the system releasing further updated models. 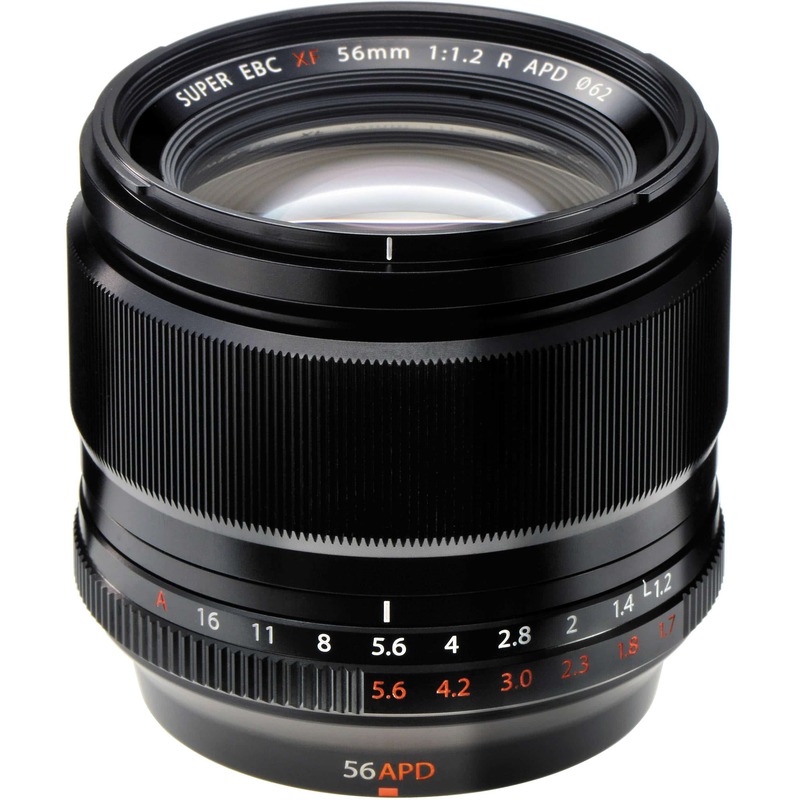 The HC lens range originally appeared on the Fujifilm GX645AF medium format camera which was introduced in 2003. The lenses were marketed under the name “Super EBC Fujinon HC” lenses, and were subsequently also released by Hasselblad branded as ‘Hasselblad HC’ lenses for the Hasselblad H system. The Hasselblad branded HC lenses are still widely available and feature the highest levels of construction and optical performance, surpassing even Hasselblad’s Zeiss lenses. Fujifilm have released an adaptor ring, the Fuji H Mount Adaptor G which allows all nine of the original Super EBC Fujinon HC and Hasselblad HC lenses to be mounted on the new GFX 50S mirrorless medium format camera. When mounted using the adaptor HC lenses support manual focusing only but continue to allow electronic aperture control (Note Hasselblad HCD lenses are not supported). Super EBC Fujinon HC lenses have Super EBC Fujinon HC embossed in white on the lens barrel, Hasselblad HC lenses Feature an orange square, followed by the letters HC embossed on the lens barrel. Fujifilm also manufactures a small number of lenses which use the cinema industry standard PL-mount system. The Fujifilm PL-Mount lenses are extremely high quality and therefore extremely expensive, take the Fujinon 14.5-45mm T2.0 Premier PL Zoom Lens for example which will set you back a bank balance crippling $99,800! A Fujifilm lens with the letter ‘R’ included in its lens designation has a dedicated aperture control ring which is used to electronically control the aperture diaphragm within the lens. Control of the diaphragm is not direct, the ring instead sends an electronic signal to the camera, which in-turn instructs the motors within the lens to alter the aperture. 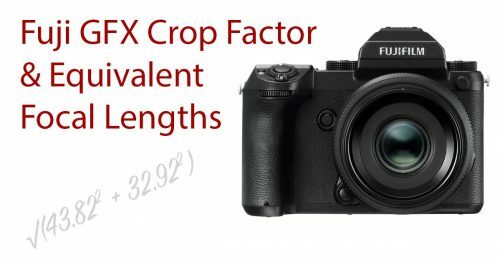 This method of control is used because Fuji X-Series cameras must allow both manual and automatic aperture control from within the camera body when non ‘R’ lenses are being used, or an automatic metering mode is engaged. Sending the signal to the camera and then back to the lens means ‘R’ lenses do not require a dedicated onboard aperture control system. ‘OIS’ lenses feature ‘Optical Image Stabilization’ which in Fujifilm lenses is achieved using a gyroscopic sensor and a corrective lens element. The sensor detects lens movement and moves the corrective lens element the amount required to correct for the detected motion. The Fuji OIS system is capable of correcting for between 4 and 4.5 stops of motion, very handy in those low light situations! Lenses featuring OSI feature the acronym OIS in the lens model designation. Fuji lenses which include the acronym ‘LM’ in the lens designation use Fuji’s ‘Linear Motor’ auto focus system. Unlike Canon and Nikon, who both use ‘ring-type’ auto focus motors the Fuji linear motor uses a different design which directly moves lens elements to achieve focus extremely quickly and almost silently. The acronym ‘EBC’ stands for ‘Electron Beam Coating’ and is Fuji’s multi-layer lens coating system designed to increase light transmittance and counteract flare and ghosting. Super EBC is the latest version of this technology. If a lens features either EBC or Super EBC then the EBC or SUPER EBC will be printed alongside the lens model designation on the lens barrel, It doesn’t however feature in the lens model designation for for example the Fujifilm XF 23mm f/1.4 R features an EBC coating. ‘ALG’ stands for ‘All-Group’ and is a focusing method designed to provide consistent optical performance throughout the focusing range. This is achieved by moving all of the optical elements within the the lens with a low inertia DC coreless motor. Lenses featuring ALG focusing do not seem to feature any indication of the features presence. The XF 18mm f/2.0 R for example features ALG focusing but it’s presence is not indicated on the lens barrel. ED indicates that a lens uses ‘Extra-low Dispersion’ glass, a technology originally developed by Nikon to allow the production of lenses that significantly reduce chromatic aberration. Previously chromatic aberration was reduced by using calcium fluorite-based glass, but it’s brittle nature and temperature sensitivity led Nikon to develop ED as a more robust solution. As far as I can discern (and correct me if i’m wrong!) all X-mount lenses feature at least one ED element. ASP and AS lenses contain at least one Aspherical lens element. The profile of an aspherical element does not conform to the surface of a sphere. Aspherical elements are used to correct coma and various other types of lens aberrations but are costly and complex to manufacture. Aspherical glass elements are used widely throughout all of Fuji’s X-mount and G-mount lenses. The acronym APD indicates that the lens contains an ‘apodization element’, which in simple terms is a type of ND filter which becomes thicker towards its edges. The gradual thickening of the element limits the amount of light allowed to transition the lens progressively towards the edges of the image area. This has the effect of smoothing the edges of out of focus objects within an image, creating beautifully soft Bokeh and an enhanced sense of depth. Currently the Fujifilm XF 56mm f/1.2 R APD Lens is the only Fuji lens to feature an APD element. Simply GREAT info. Plain & simple to understand & remember. Thanks for posting. So many times I’ll read designations on lenses & have not a clue what they mean. This certainly & concisely clears that up for Fuji!!! Hi. Great Site! I have a I:56/I35 Fuji photo optical Fujinon EP Lens 684632 and was wondering what the EP stood for. Thanks. As far as I know, the E stands for “Enlarger” and the P stands for “Professional”. Essentially it’s a lens from Fuji’s high end enlarger lens lineup. FUJINON LARGE FORMAT LENS LIST. Pretty lame. 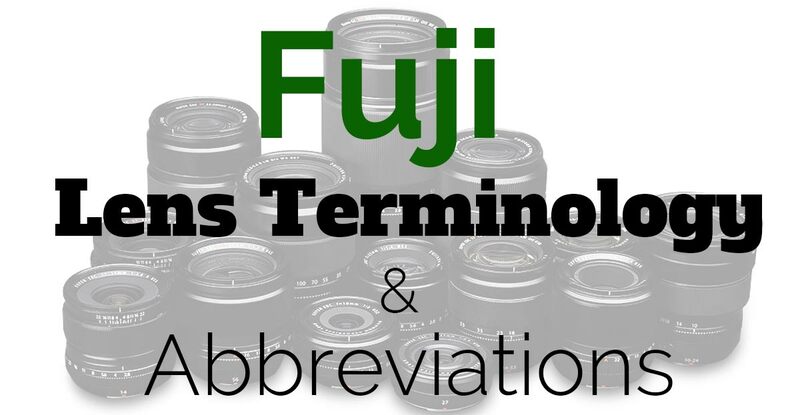 It covers just a few of Fuji’s lenses and should be titled — “Just a bit of Fuji’s Lens Terminology & Designs”. For example, it completely leaves out all of their numerous large format lenses, as well as their countless lenses for the smaller formats. It proves, once again, don’t believe much of what you see on the Web. I take issue with this, Joe. There’s nothing incorrect on this page to my knowledge, so suggesting you can’t believe it is a load of tosh. Why don’t you be more helpful like other people and share you obvious knowledge in a helpful way? If you’ve got information about other lens types, you could simply point out that they are missing and we can do some research to add them. This is how helpful people behave on the internet. We don’t claim to be the font of all knowledge, and in this case we started by listing the ones that 95% of people are searching for. Hi, great info! I am currently a Canon shooter, so I understyand all the Canon terminology, but I’m seriously considering a switch to a Fuji XT2 because I like the technology and the compact size (compared to my 5dMK3 at least!). One thing I haven’t been able to find out about the Fuji lens is a constant, or fixed aperture lens ie: the aperture you set will stay the same even when you change the focal length. Can you help? Are you trying to find out of there is some sort of name or acronym for a Fuji lens with a variable aperture? I don’t think there is, you would simply look in the lens name for something that lists multiple apertures. 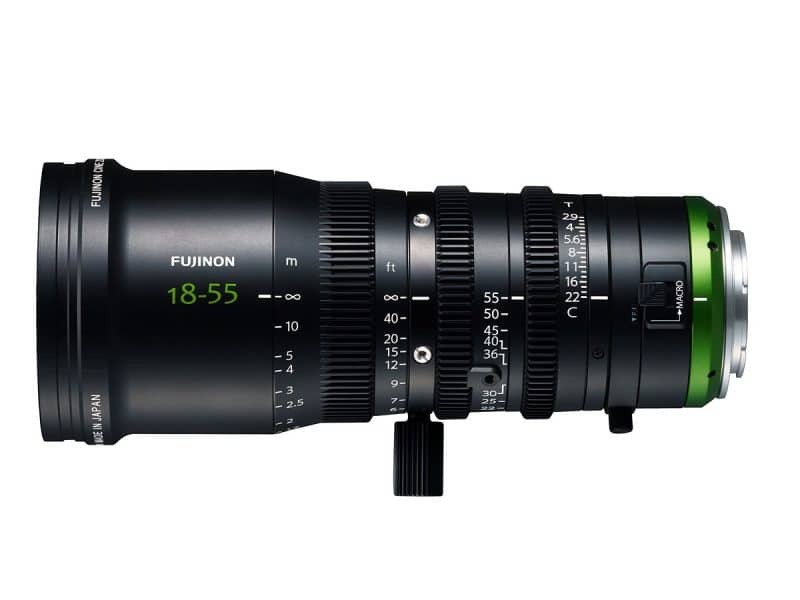 For example, the FUJINON LENS XF18-135mmF3.5-5.6 R LM OIS WR. This lens has an aperture that varies from f/3.5 to f/5.6. If you do not see this kind of range in the lens name then it has a constant aperture. This naming scheme is the same as how Canon does it as well (and everyone else I think).